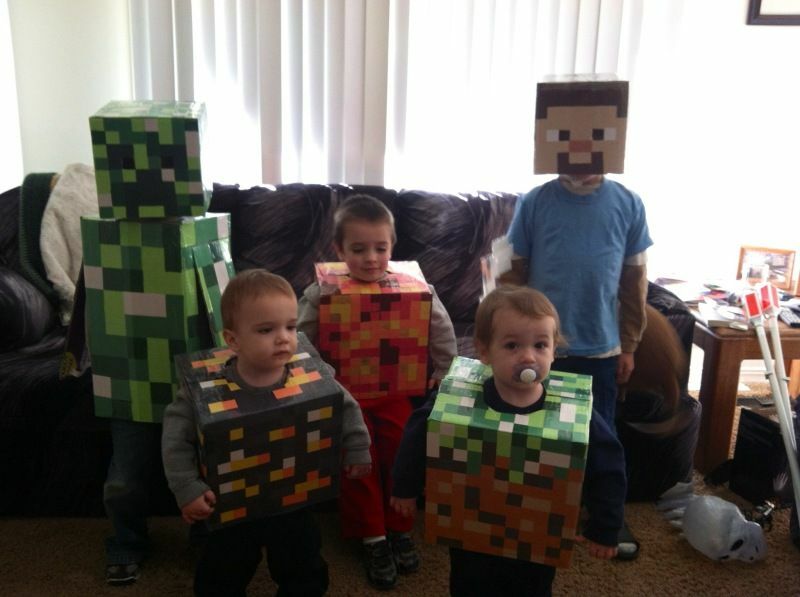 The costumes were a huge hit with anyone who recognized MineCraft. The babies weren't too fond of being stuck in a box but we were able to distract them with candy. They loved the trunk-or-treat and were so excited to be given candy. This looks so intricate & time consuming! Of course, my son wants to be a minecraft character this year. Can you tell me how you made the Creeper (green guy on the left)? 1 small square box and 1 big rectangle box. I used a mix of construction paper and paint to get the different shades of color (depending on if I had the right shade in paper or paint lol). I looked up pictures online to try to get it to look as much like the actual character as possible. I ended up doing bigger squares for the creepers body than I did for the head and the rest of the costumes, because it was just so much work lol. I cut a hole for the head and the bottom out for his legs and then cut flaps for his arms in the sides (with straps for him to hold them closed if he wanted). I used packing tape to "laminate" the whole thing to keep it from getting ruined. Oh and I also used a ruler and pencil to draw out a grid on the box first so it was easier to make all the squares even. And if the box had a design on the outside I took it apart and taped it together inside out because the paint and glued paper worked better on the plain cardboard side.